Birth of Charles Hunt registered June quarter 1892 in Dudley. 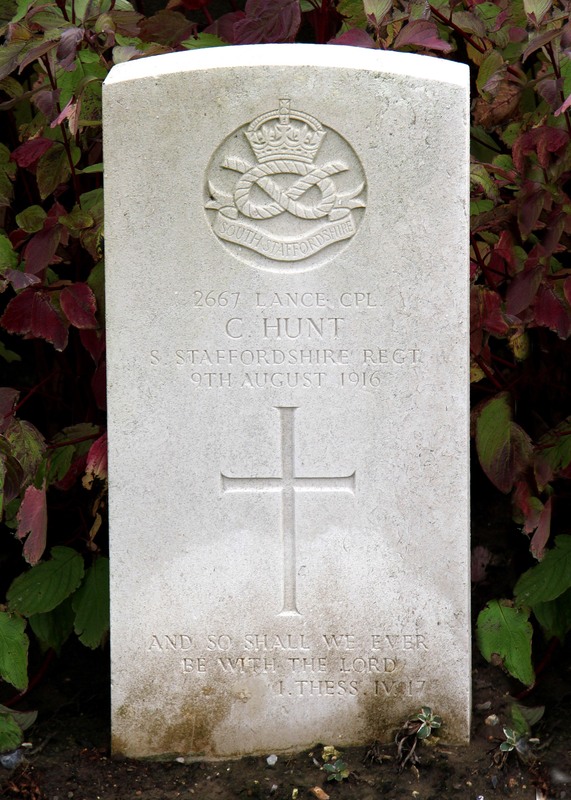 Charles Hunt died of wounds on 9th August 1916 at one of the 3 General Hospitals (3rd, 16th, and 2nd Canadian) at Le Treport, the town where the River Somme meets the sea. Because Charles was in a General Hospital, we cannot be sure when he received the wounds which led to his death. On 1st July 1916, the first day of the Battle of the Somme, the 1/6th South Staffs had fought at Gommecourt, the very northern extent of the Somme battlefield. Here the attack was a diversionary raid intended to keep the Germans occupied, if there was no attack here the German guns would turn south to the next attacking division. The objective was to take the Gommecourt salient strongpoint, but to go no further. On the day, 82 men of the 1/6th South Staffs were killed, with at least 10 more dying of wounds on subsequent days. It is possible that Charles was wounded here, but as he died over 5 weeks later he would most likely have been back in a UK hospital. For the remainder of July, the 1/6th South Staffs alternated between the front line near Gommecourt and spells out of the line in Reserve. The times in the front line were noted as “quiet days”. On the night of 5th/6th August, a raiding party of 30 men from the 1/5th and 30 from the 1/6th South Staffs was to carry out a trench raid, again in the Gommecourt area. The objectives were to kill enemy personnel, obtain identification, and destroy trenches. The War Diary has scant detail of the success, believed to be minimal, but does mention that our artillery was still firing when it ought not to be. It would seem more likely that Charles was wounded in the trench raid than on the First Day of the Somme, just because of the time interval. Charles is buried in Mont Huon Military Cemetery, Le Treport.